From our farmers: Timing is everything! 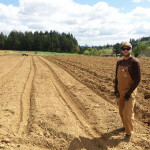 This piece was contributed by Brian Shipman of Wild Roots Farm, one of the farmers enrolled in our Farm Incubator Program. 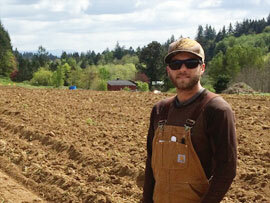 This is the first in a series “From our farmers”; stay tuned for more Headwaters news soon! There’s a simple, overused saying that I frequently refer to when making decisions on the farm or in the garden: timing is everything. In the spring, time moves erratically, in fits and spurts that are dictated by our transitioning weather. After spending much time in the winter laying plans and plotting calendar schedules for the upcoming growing season, it is so exciting to see the days lengthen and temperatures rise. All the plans we make in the off-season are so important in the spring, when we don’t have time to waste thinking about numbers, dates and so on. There are basically two modes to a farmer’s year: on- and off-season. For most farmers, winter is off-season – time for rest. The spring is the crucial transitional period when we know the countdown has begun – and it can be a challenge to remain patient knowing the work that lies ahead! 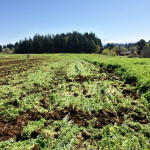 A hearty stand of cover crop (right) is worked into the soil at Wild Roots’ field with the first passes of the disc. 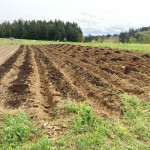 The bed shaping process with top dressing of compost. Brian standing next to finished seed beds! For our Headwaters farmers, there is one major event that happens in the Spring to announce the “real” start to the growing season: plowing. Once the ground has dried to a point that it is workable with a disc, or plow, it is time to open that soil up and prepare it for planting. In our case, a lush cover-crop is cut down and incorporated in to the soil by discing the field (see photos, right). This is a process that can take up to a month depending on the conditions, requiring several passes, and as ever – timing is everything. If the ground is too wet, bringing in the tractor too early can cause long-term compaction issues. Hip-high grasses and legumes need to be properly broken down within the soil before it will be ready to re-plant in to – patience will be rewarded in this case because microorganisms in the soil need time and warmth to properly decompose green plant matter. From a business standpoint, all farmers are eager to get planting right away, but there are other factors at work besides just the bottom line. Even in April, which heralds the entrance of spring, the nights are too cool for most plants to thrive without cover over them. This time of year seems to hang on a knife-edge, knowing that once we start planting the “switch” has been turned on for the year, and it’s non-stop until winter. Balancing four basic needs is the basis for any farmer’s livelihood: soil, plant, business and personal. Timing is the real factor in reconciling all of those, I believe. We know time marches in one direction, at one speed, so adjusting our movements to fall in step with that universal metronome will always be the challenge the farmer must rise to meet. Finding the rhythm of a changing weather paradigm seems like trying to hit a moving target, so we approach our decisions with prudence and conservation in mind. Historical lessons like the Dust Bowl resonate in farming lore, an example of irresponsible stewardship and farming practices during a time that cared not for the needs of the soil. When we frame our decisions against the backdrop of the needs of the soil, we take the most sensible approach to farming, even though it is tempting to gamble and push the limits. Let’s not get bogged down though in lyrical contemplation, get out there and make the most of our short time on this ball of dirt — Carpe Diem! EMSWCD » Conservation Legacy » From our farmers » From our farmers: Timing is everything!